Spain is a culinary crossroads, a cuisine formed by the confluence of different cultures over the centuries. Christmas is the time when this rich gastronomic mix is at its high point. There is so much variety that you’ll want to taste everything! Many sweets are traditional desserts made with almonds, honey, sugar, and fruit. Four of the most popular Christmas desserts, found in almost every household are turrón, polvorones, mazapan, and mantecados, each described below. Learn to prepare any or all of them, and you’re sure to have a ¡Felíz Navidad! Turrón is a very old, traditional sweet of Moorish (Arabic) origin and has been a popular sweet for centuries. It was considered so valuable that the King of Spain once warned its makers not to be so generous with it! Learn more about the treasured Spanish sweet called turrón and where to buy it. Traditional Polvorones or Almond cookies are a rich, shortbread-type cookie. They are very traditional Christmas sweets whose recipes have not changed in centuries, except for the use of the modern mixer. These cookies are very flaky and soft and are made with flour, lard or vegetable shortening, powdered sugar, and cinnamon. The dough is refrigerated, then rolled out, cut and baked. For a crisper version that is not as crumbly, try this Polvorones recipe. Although Venice and the Orient argue with Toledo’s claims to having invented marzipan or mazapan, it is generally thought that the Moors brought a sweet almond and honey mixture to the Iberian peninsula when they invaded in the 8th century. They are believed to have called it mautha-ban or mahsaban. There are still other stories from Venice and even one about the nuns of San Clemente feeding the soldiers who were wounded in Navas de Tolosa battle in 1212 A.D. a type of almond bread. Wherever it came from, it is delicious! Today the gourmet varieties of marzipan still contain only sugar and almonds, although cheaper varieties contain rice flour and potato starch. Mazapan can come in the shape of little figures, covered with sugars or pine nuts or can even contain a rich, delicious filling. Toledo is the most famous producer of mazapan, which must use sweet almonds that contain at least 50% fat. The almond to sugar ratio must be a least 1:1 and the almonds must represent at least 50% of the weight of the final product. The Spanish word for lard is manteca, so you can imagine that the traditional recipe calls for lots of it! These small, crumbly cookies come in different flavors and are wrapped in brightly colored wrappers. 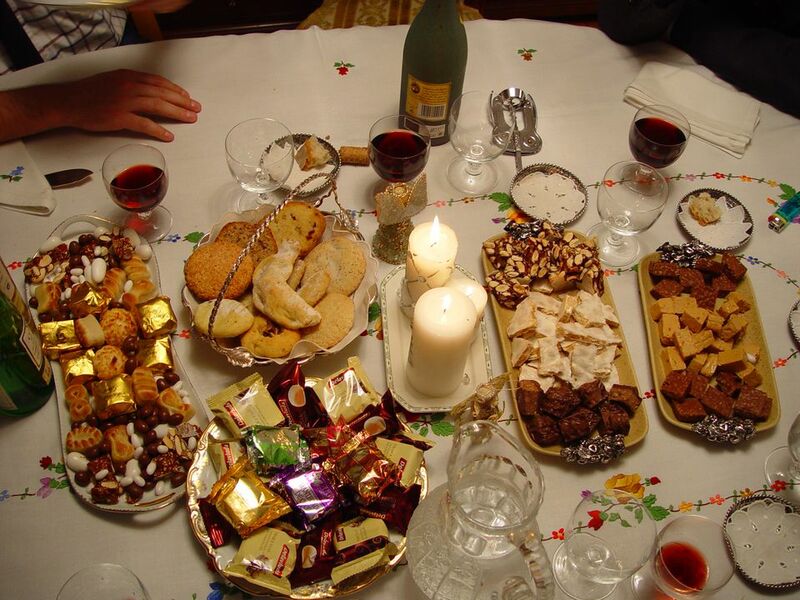 Along with the other treats we’ve mentioned above, mantecados are synonymous with Christmas in Spain. Although these cookies are traditionally almond or anise flavored, in some parts of La Mancha, a cup of wine, or lemon or orange peel are added. The popularity of these cookies is not confined to Spain. Spanish ladies took their recipes for mantecados with them to Latin American, so they are well known in every country and particularly popular in Argentina. The Canary Islands are located off the western coast of northern Africa and become a true culinary crossroads. Historically, the islands were the first stop on Spanish soil as ships returned from the Americas, and thus they began growing and incorporating foods from the Americas into their diets, such as potatoes, beans, and tomatoes. The traditional Christmas treat called "truchas" are turnovers filled with sweet potato and ground almonds, which are delightful and not difficult to make.